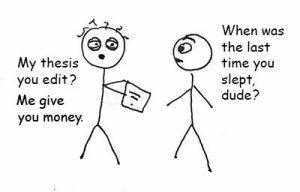 Most people get through life without writing anything longer than a college term paper, but at some point, you may be faced with the task of writing something longer and more involved, like a capstone paper, thesis, dissertation, or long business report. But it’s OK. Your work will follow the same path as it would for any other writing assignment; it will just take longer and be more involved. My post will give tips to help first-time authors of longer works strike out on the road to successful completion. From start to finish, when writing a longer work, organization of your process and prose is critical. Once you’ve determined your topic and written your thesis statement—and you’re sure it’s neither too broad nor too narrow (hint: consult your professor if you’ve got one)—it’s time to outline your project. Like an outline for a short essay an outline for a longer work helps you break your work down into smaller pieces you can manage one at a time. It helps you see the scope of the project and make sure you include everything you need, as well as leave out things you don’t need. As you write, you can follow your outline, or you can skip around and work on sections out of order. (Note from Julia: write the intro last!) You will probably realize as you go that you need more research for some parts, so you’ll have to take a break from writing to be sure you’ve got all the source material you need. Make sure you’re following your style guide’s recommendations about citations, and definitely work on your reference list as you go. Leaving that to the end is a sure-fire way to leave important works out. Once you’ve got your project mapped out and you’ve begun writing the chapters or sections, you have to stitch them together so that your readers can follow your argument easily. In a previous post, I discussed the use of specific transitional words and phrases to use when moving from one sentence to the next. When moving from idea to idea or chapter to chapter, you will need longer passages to point readers in the right direction. Though these examples might seem obvious in tone, that’s what you want when you are leading your readers though your work. Headings are another great way to make sure your work flows smoothly for you and your readers. Often your headings can come right from the outline you created to guide your writing in the first place. Logical and timely headings help your readers pause between ideas, which makes it much easier for them to understand your work. No matter the piece of writing, I recommend consulting an editor before completing a final draft. You might hire a professional, such as Proofreadingpal.com, or ask someone you know who’s got reasonable writing skills to look at your work. Consulting an editor is especially important for a longer work. It’s easy to lose sight of your project’s focus or to miss problematic details when you have been working on something for weeks or months, and an editor brings fresh eyes. Some things your editor should look out for are sections you should cut (too much filler and fluff), sections to beef up (not enough support), and sections to redo (don’t flow or make good sense). Once you have feedback from any editors, follow up on their comments and revise thoroughly. If you have questions for your editor, ask. Finally, don’t forget to proofread once all your revisions are done. As you embark on your journey to authorhood, remember these key ideas of organization, transitions, and editing. In a future post, I’ll give you some tips to use Microsoft Word’s features to organize and write a well-crafted longer work.